Starting Wednesday, April 26th, staff will no longer have administrator rights on their Luther workstations. Faculty administrator rights will be removed at a later date. While daily work will not be affected by this change, the ability to install software and make system-wide settings changes will be limited. If you need software installed, please contact the Technology Help Desk. Currently, faculty and staff are administrators on their Luther computers. This means faculty and staff may install programs on their computers, whether knowingly or unknowingly. In order to reduce problems that have been occurring from the installation of programs that should not have been installed, faculty and staff will no longer be administrators on their Luther computers. This will have the added benefit of computers lasting longer and running more reliably. Staff administrator rights will be removed starting April 26th. Faculty administrator rights will be removed at a later date. In addition, separation of administrator rights from workstation logins will greatly increase Luther’s IT security posture. A study released last year by the IT security firm Avecto demonstrated that nearly nine-out-of-ten vulnerabilities affecting Windows in 2015 could have been prevented by removing accounts with administrative rights. While the report on 2016 is yet to be released, previous years echo this same sentiment. If you have questions, comments or concerns contact the Technology Help Desk by calling x1000 or emailing [email protected]. Everyone organizes their Google Drive differently. Many Google Apps users don’t organize them at all. By using a few best practices, Google Drive can be much more organized and easier to navigate. Folder structure comes first: The best starting point is creating a clean folder structure. An easy way to do this is to create a folder for each category of document and then make subfolders for each aspect of that category. To create a folder, click the red NEW button and then select the option for folder. As the owner, you can give others complete ownership of a file, or some level of viewing and editing access. 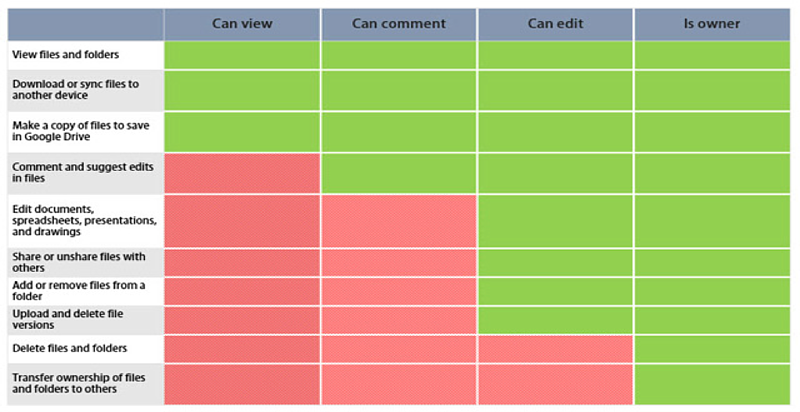 Here’s a chart that compares the access for a viewer, commenter, editor, or owner: Transfer Ownership of Files/Folders to Someone Else: Having folders and subfolders makes it easier to share documents. You can share the top tier folder and all folders and files within that folder will be shared with those to whom you choose. You can also do the same with subfolders. The process to digitally “hand over” Google Drive documents and folders is easy. For assistance in organizing your Google Drive, contact the Technology Help Desk. Luther's network shares are filling up. Please review your shared network drives and remove unneeded files, particularly the administrative and academic "common" shares (i.e. the T Drives at admin1.luther.edu/luther_common and academic.luther.edu/common). As a reminder, the "common" shares are only intended for temporary storage of files. This is a great time to take a look at your files and see if any of them should be sent to college archives. For information on what needs to be saved and/or how to go about doing it, please contact Hayley at [email protected] or call 387-1805. Unsure how to access these locations? Contact the Technology Help Desk at [email protected] or 387-1000.
Review files by March 15, as ITS is transitioning to new servers this spring. Dry air can lead to damaging static discharge. Humid air can cause condensation. The College is establishing a new policy in which Luther email accounts for students, faculty and staff will require Google 2-Step Verification. 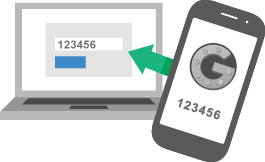 Faculty and staff must enable Google 2-Step Verification prior to Dec. 1, 2016 for all Luther email accounts in order to continue to successfully sign in. Students must enable Google 2-Step Verification prior to Feb. 1, 2017 for their Luther email accounts. You may enable 2-Step Verification yourself. Sessions are available if you would like assistance in enabling 2-Step Verification. If you have a laptop, please bring it. Likewise, if you have a cell phone, please bring that as well. 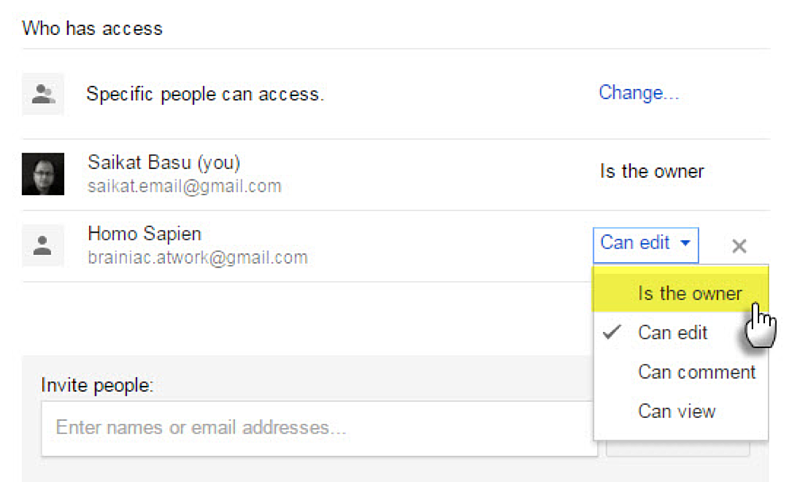 Click "Signing in to Google"
Want to know more? The Technology Help Desk has more information to help you protect yourself from phishing emails. On Wednesday, October 12, ITS will deploy an update to all faculty and staff workstations to improve security. The update will lock your workstation after 25 minutes of inactivity. To unlock your workstation, enter your Norse Key password. If you use your laptop for presentations, to avoid your laptop locking during the presentation, move the mouse every 15-20 minutes. ITS recommends you lock your workstation every time you leave your work area, even if only for a couple of minutes. For details on locking your workstation, see “Protect Your Information”. This additional measure is being implemented to improve security campus-wide. Contact the Technology Help Desk with questions. Good password practices help protect our community, our college, and ourselves. Most people underestimate the impact of compromised data, identity theft, and other security issues. New restrictions on Norse Key policies have already taken effect. Check out the Norse Key Password Policy for specific rules. To see other changes we’re making as an institution, changes you can make as an individual, and other information about password security check out the Improving Password Policies Guide. Technology Help Desk maintained by Diane Gossman. Page last updated on 12 October 2018.